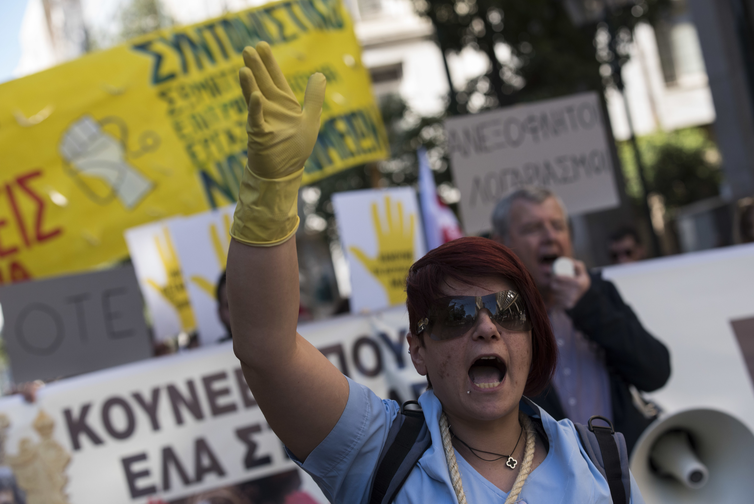 Public hospital cleaners lead anti-austerity protest, Athens, Greece 2017. Georgiou Nikolas/ABACA/ABACA/PA Images. All rights reserved. Austerity. From the left to the right, governments have only that one word on their lips. The European parliament’s elections are approaching (in May) and there are fears everywhere that the tidal wave of extreme right-wing movements will swell, with Brussels being blamed for austerity policies, and thus for recession and unemployment. This situation has led to an explosion in the rejection of foreigners and refugees, and to a demand, by a large part of the European population, for xenophobic and authoritarian policies. Demanding budget cuts, which in practice have a direct impact on public services including healthcare and education, is not only the bedrock of populism, authoritarianism or social unrest. It is also a frontal attack on the rights of women who tend to be more dependent on these services, which can shift the burden of unpaid care work from their shoulders onto social systems. Cleaning, cooking and looking after dependent family members – children, elderly people and people with disabilities – are still largely seen as “women’s affairs”. In France, women do 64% of the country’s unpaid care and domestic work, spending at least the same time on this as on paid activities. Women and girls are also the most impacted when countries offer poor basic facilities, especially in developing countries. In sub-Saharan Africa, where more than two-thirds of the population lacks access to domestic tap water, women and girls are the main providers of the household water supply and sanitation. Girls are left to fetch water and firewood while their brothers go to school. This means that women have fewer opportunities for education, training and work. In the EU, 25% of women cite care and other family responsibilities as the reason for not being in the labour force, compared to only 3% of men. Even when women manage to work, they are often trapped in low-paid, poor-quality jobs, frequently in the informal sector. Many work without labour protections and decent working conditions, with negative consequences for current and future income (including fewer rights to pensions), adding to the already unacceptable global gender pay gap of 23% between women and men. UN Women showed, for example, that most of the rise in total employment since the financial crash of 2008 in the UK is in low-paid self-employment, with women accounting for 54% of this increase. As a result of such trends, in most countries, women are less likely than men to receive pensions in old age: the poverty rate of elderly European women is 37% higher than that of elderly men. Women’s access to welfare systems, quality public services and infrastructure is now a priority of the international community. It is actually the main topic of the United Nations’ 2019 Commission on the Status of Women (CSW) event in New York from 11 to 22 March. Its conclusions are non-binding but can help structure the gender equality policies that countries implement in the years to come. Nearly 200 trade union women and men from around the world will be attending and participating in this meeting as part of a global union delegation including Public Services International (PSI), of which I am General Secretary. We welcome many aspects of the report prepared by the UN Secretary-General, ahead of the meeting, which emphasises a universal and rights-based approach to infrastructure and services. However, it’s not certain that governments will translate these principles into concrete strategies to end inequalities. This is what PSI and the global union delegation are calling for. It’s also urgent to reform the global international fiscal system, as noted in the UN Secretary-General’s report. This means ending mechanisms that facilitate tax avoidance, which drain resources that could be invested in public services and other policies supporting gender equality. Tax revenue lost by developing countries due to what’s called ‘trade mispricing’ alone is estimated to be worth between $98 and $106 billion a year – more than annual capital costs needed to achieve universal water and sanitation coverage. Importantly, we want to highlight the essential and primary role of states as the guarantors of the human rights of all women and girls. When private companies take over basic public services and infrastructure, such as water and sanitation, or health and education facilities, this results in deteriorated quality, especially for the most vulnerable. A human rights-based approach to public services cannot be guaranteed within a ‘for-profit” system. In these troubled times when unscrupulous political leaders exploit xenophobia, we also call on the representatives of governments in New York for the CSW to commit to policies to strengthen public services for all women, including women migrants, refugees and asylum seekers. It is especially worrying that some European countries are trying to limit migrants’ access to welfare benefits. Without such policies, it will be impossible for most countries to meet their renewed commitments to gender equality and human rights under the 2030 Agenda for Sustainable Development. Women will still struggle to remain in the labour market and secure unemployment benefits, health protection, and pension rights. They will not find time for rest, leisure or political participation. This is why universal, rights-based quality public services are a feminist issue.